Without abortion rights, there isn’t a lot left to the fundamental ideals of equality and self-determination. Is there such a thing as pro-life feminism? In January, New Wave Feminists, an anti-choice organization, was briefly listed as a sponsor on the website of the Women’s March on Washington. “Intersectional feminism is the future of feminism and of this movement,” said Bob Bland, one of the event’s co-chairs. “We must not just talk about feminism as one issue, like access to reproductive care.” Leaving aside the question of whether Bland understands what intersectionality means—pro-life is a political stance, not an identity or a social position—can feminism, a social-justice movement for women’s equality and human rights, encompass the belief that women should carry to term every fertilized egg, no matter the consequences? Lauren Enriquez, a PR manager with the anti-choice Human Coalition, thinks so. In a New York Times op-ed, “How the New Feminist Resistance Leaves Out American Women,” she argues that the movement’s “radical position on abortion” (i.e., supporting Roe v. Wade, the law of the land for almost half a century) cannot “unite American women…because it rejects the position that most American women take on abortion—that it should be completely illegal, or legal but with significant restrictions.” Never mind that the Knights of Columbus/Marist poll she cites is biased and that other polls show majorities in favor of choice (69 percent of Americans, according to Pew Research, support Roe), with only 15 percent supporting the Human Coalition’s position that abortion should be banned. Let’s also set aside the fact that the Human Coalition’s leadership is mostly male and heavy on conservative evangelical preachers, and that the group is closely tied to James Dobson, who promotes the Southern Baptist doctrine of wifely submission. Hard to see the feminism there. There’s a larger issue than just numbers here: The Constitution is not a popularity contest. Not so fast. 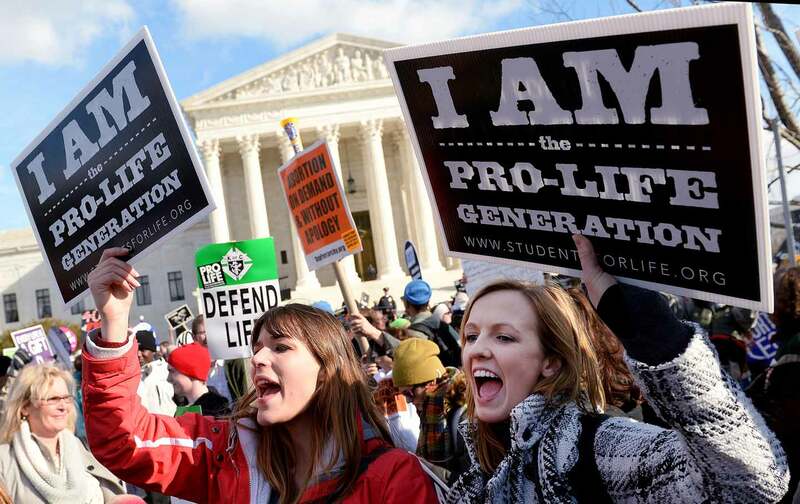 Like it or not, abortion rights are at tremendous risk right now. A political movement that doesn’t defend them and promotes instead some vague notion of “unity” is bound to be weak tea to the women who are the movement’s strongest activists. After all, nothing prevents anti-abortion women from being active in other feminist and progressive causes. Look at the Nuns on the Bus, who worked so hard to support the Affordable Care Act. It’s called coalition politics. If Enriquez wants to fight for the rights of battered women or lesbian mothers, no one is going to turn her away. Anti-abortion women were welcome to join the Women’s March, after all, and some did; they were just not welcome to formally sponsor it. Rights and personal ethics are not the same. But restricting abortion is not compatible with respecting women’s autonomy. But there’s a larger issue here. The Constitution is not a popularity contest. No one would tell the ACLU that it should attract more members by championing prayer in public schools, a cause supported by 61 percent of respondents in a 2014 Gallup poll; the separation of church and state is simply too integral to the ACLU’s mission. Similarly, women’s constitutional right to decide for themselves when and if to become a mother is an essential part of feminism today. If you demand that every girl and woman who becomes pregnant bear a child no matter the consequences to herself, and if you call on the government to back that up through criminal law, there isn’t a lot left to the ideals of equality and self-determination that are fundamental to feminism. One sperm can derail a woman for life. The patriarchal religions that sustain the anti-abortion movement explicitly oppose those ideals and correctly recognize that reproductive rights are what make them possible. I’m aware that secular and atheist anti-choicers exist, of course, especially among younger people. I had a lively phone chat with Destiny Herndon-De La Rosa, founder and president of New Wave Feminists, who has a different view than Enriquez about who needs whom: “The pro-life movement needs feminism,” she told me. “Stop just focusing on the fetus! Focus on the woman! Freaking bloody photos and a guy with a bullhorn are not going to help!” Still, even when it’s made by hipsters, the anti-choice argument inevitably demands that a woman drop everything to incubate that egg, so how would that work out? The last time abortions were illegal, women risked life and limb to have them anyway. Even back in the heyday of housewifery, the 1950s, managing one’s childbearing was that important. My own view is that people are complicated and mix up their politics in all kinds of ways. A woman can believe that women are equal to men and also that a fertilized egg, embryo, or fetus is a human life and that, if pregnant, a woman should protect and nurture it. She can be anti-abortion for herself, in other words, and many pro-choice women are. But rights and personal ethics are not the same. I just don’t see how restricting and criminalizing abortion, bullying women on their way into the clinic, and pushing lies—that abortion will give you breast cancer, make you infertile, or lead to a life’s worth of misery—are compatible with respecting other women’s right to make their own moral decisions in an area where people disagree strongly and probably always will. PS: If high-quality birth control were free and available to all, the abortion rate would go down. But where are the anti-choicers promoting that? Listen to Katha Pollitt discuss reproductive rights and feminism on the Start Making Sense podcast.